This is a waterline or full hull 1/350 scale resin kit by Combrig Models. 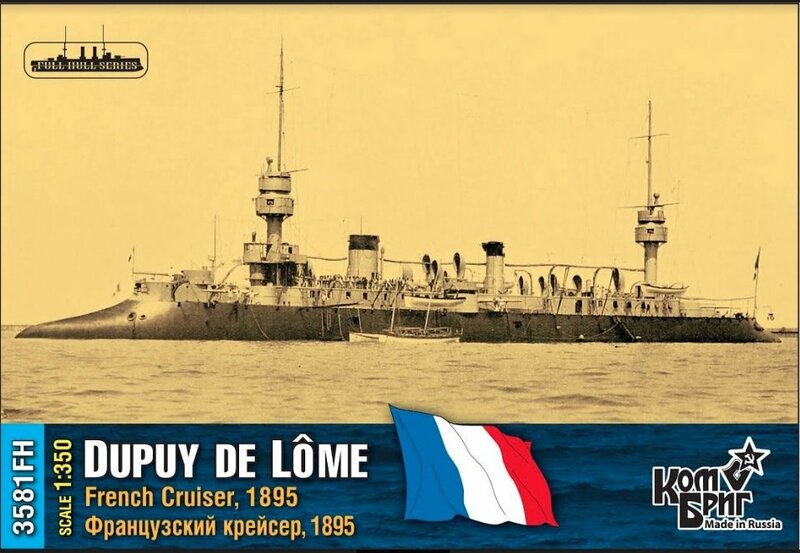 Dupuy de Lôme was an armoured cruiser built for the French Navy (Marine Nationale) during the late 1880s and 1890s. She is considered by some to be the world's first armoured cruiser and was intended to attack enemy merchant ships. The ship was named after the naval architect Henri Dupuy de Lôme. Dupuy de Lôme's completion was delayed by almost two years by problems with her boilers, but she was finally commissioned in 1895 and assigned to the Northern Squadron (Escadre du Nord), based at Brest, for most of her career. The ship made a number of visits to foreign ports before she began a lengthy reconstruction in 1902. By the time this was completed in 1906, the cruiser was regarded as obsolete and Dupuy de Lôme was placed in reserve, aside from one assignment in Morocco. The ship was sold to the Peruvian Navy in 1912, but they never paid the last two installments and the ship remained inactive at Brest during World War I. The French agreed to take the ship back in 1917, keeping the money already paid, and they sold her in 1918 to a Belgian shipping company that converted her into a freighter. Renamed Péruvier, the ship's engines broke down and she had to be towed to her destination where part of her cargo of coal was discovered to be on fire during her maiden voyage as a merchant vessel in 1920. Deemed uneconomical to repair, Péruvier was towed to Antwerp and later scrapped in 1923.